Remember those Loveable Bears from the 90's? Well they've made a comeback and have been relaunched under the name 'Love2Love Bears'. 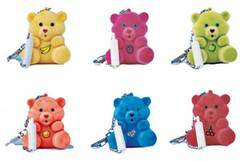 The Love2Love Bear collection comprises of six scented bears each with feeding bottle to feed your interactive bear, programmed electronic nurturing sounds and lights which are triggered when you feed your bear. It also comes with a keychain so you can take your bear everywhere you go. Great nostalgia for you adults out there and a great toy for girls everywhere. Get yours from Argos for £6.99.